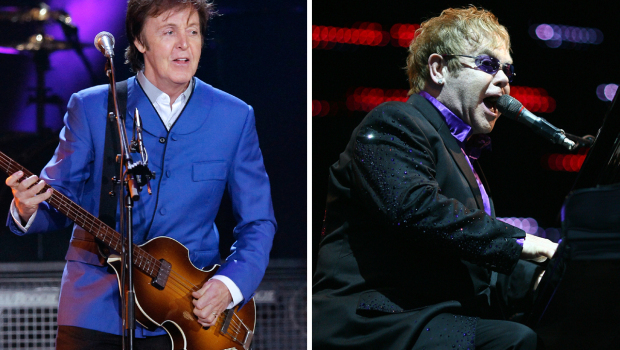 So, this past week there has been a lot going on with two of my favorite musicians, Paul McCartney and Elton John! First, both of them performed at the iHeartRadio Music Festival in Las Vegas last weekend, and while I was not in attendance, I loved watching both of them perform via a live online stream! They were fantastic as always and performed many awesome songs, two of which I will share with you in this post! And here’s Paul McCartney performing a great song, “Save Us”, off of his new album on Day 2! I cannot wait for this album to come out in October! I loved watching the Emmys this past Sunday, because not only did my favorite actor, Jim Parsons, take home another award, but Elton John also performed! He did a “tribute” to Liberace, which was nice except that it seemed more like a plug for his new single, “Home Again”, than a tribute to a fallen musical legend. Oh well, he was great anyway and I love the song! So after that, Paul made an appearance on Jimmy Kimmel Monday night, giving a hilarious interview and performing a free concert on Hollywood Blvd for 10,000 lucky fans! I watched that as well, and Paul amazed me with his unbelievable talent as he always does. Here’s Paul performing his new single, “New”, from that concert! I also enjoyed watching Elton John’s appearance on the Ellen show on Wednesday. Here’s a funny clip of him talking to Ellen about Miley Cyrus’s controversial performance at the VMAs this year. He is just hilarious! I honestly can’t believe that we’ve been able to obtain tickets to see not one, but TWO Sirs in one year! What incredible luck! In honor of this amazing situation, I’m planning on posting my top 10 favorite Elton John songs tomorrow!